Introducing your baby to the world of food is exciting, but it comes with lots of questions: When do I introduce solids? What type of food do I feed him first? How do I balance solids with breastfeeding or formula feeding? We’ve got answers to all of those questions and more with tips from experts like the American Academy of Pediatrics (AAP) and The World Health Organization (WHO). Because every child is different, it’s a good idea to also talk to your pediatrician about embarking on this fun (and messy!) adventure. When Do I Start Feeding My Baby Solid Food? In terms of age, you’ll hear slightly different advice. The AAP, for example, says to start solids between 4-6 months. The WHO, on the other hand, says not before 6 months. What they both agree on is that your baby should be physically ready to manage and digest solid food. A basic rule of thumb is to wait until your baby can control his head and sit with little support. 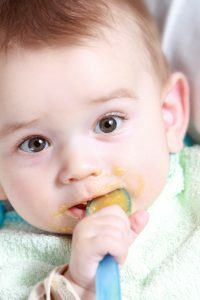 Our article about readiness for solids has in-depth information about when to start purees and different types of food your baby can chew. What Do I Feed My Baby First? You may hear it’s best to start with single-grain baby cereal mixed with breastmilk or formula. You may also hear it’s wise to start vegetables before fruits, so that your baby doesn’t develop a “sweet tooth” and reject vegetables. Not so, says the AAP, who points out there’s no research to back up these recommendations. They say go ahead and start with any food you’d like (except honey and cow’s milk to drink, which are off limits until age 1). They point out that pureed meats are excellent first foods for breastfed babies because after age 6 months they need additional iron. The AAP does advise, however, that you introduce one new food at a time and wait a few to several days in-between; this allows you to watch your baby for signs of food allergies or sensitivities (like rash, swelling around the face, wheezing, vomiting, diarrhea, or blood in the stool). Start slowly, offering your baby about a teaspoon of highly-pureed (even slightly watery) food on a spoon. If he tolerates that and shows interest in eating more, work your way up to a tablespoon. Continue until you get to the AAP’s recommended portion size for 6-12 month-old babies: about 1/2 cup of food per meal. Be sure you’re not giving your baby so much food that it interferes with him getting enough breastmilk or formula (see below). The AAP recommends that you feed your baby exclusively breastmilk or formula for “a minimum of 4 months, but preferably for 6 months.” Breastmilk or formula should remain his primary source of nutrition until he is 12 months old. Experts say that before age 1, feeding your baby solids is less about nutrition than laying the groundwork for eating: Getting him interested, exposing him to different flavors and textures, and strengthening the oral-motor muscles to chew and the fine-motor skills to self-feed. That way, he’ll be ready to transition to solid food as his main nutritional source after his first birthday. After starting solids, your baby should still be getting 22-32 ounces of breastmilk or formula every day. If solid food is interfering with that, offer solid food after or in-between breast or bottle feeding, not before. Should I Delay Giving My Baby Peanuts & Other Common Allergenic Foods? Recently, the AAP reversed its recommendations on how to introduce highly-allergenic foods to your baby. They used to recommend waiting until your baby was older to give him foods like peanuts, tree nuts and eggs. The idea was that babies’ gastrointestinal systems were immature, sensitive, and prone to reacting to the most common food-allergy offenders. Further research, however, showed the opposite: The earlier these foods are introduced, the less likely a baby is to develop an allergy. So, not only is it okay to give your baby peanut butter, almond butter, pureed eggs and the like, it’s recommended! This is an important topic, so be sure to head over to our article about safely introducing allergenic foods for detailed information. For tips on nutrition and encouraging healthy eating habits from the start, head over here.